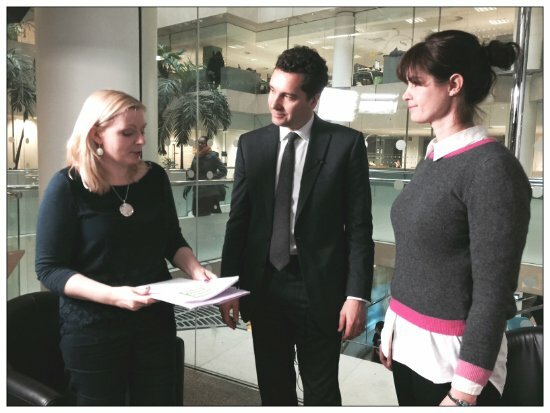 Last week, we asked if you had any views on the SEND reforms in your area so we could pass them on to the SEN Minister, Ed Timpson when SNJ went to the Department for Education last week. And boy, did you tell us! Many of them shared similar concerns about how the SEN and Disability reforms are being rolled out in a number of LAs. We received one response that was positive. Family had been engaged, family had been informed, outcomes were agreed together and family were happy with the new EHC Plan. "The aspiration of the government is not the reality of the local authority. It has been diluted down considerably"
So many of you (and this includes the practitioners who responded) were concerned that either your LA didn't appear to understand what was expected of them or that the front line staff hadn't received any (or very little) information. Some staff have yet to receive any training, or the training has only taken place this month. There was also an apparent lack of knowledge around the "person-centred" approach that the new Children and Families Act is supposedly all about. It was felt that most of the training offered to practitioners was regarding the paperwork changes rather than the cultural changes which are just as important. Person centred training wasn't being offered or was something being discussed for the future. "Parents are being told things like, 'You can't get that support on that course' or ' it doesn't matter what the EHC says, the experts at county hall will decide what provision you will have"
"Things are still very much open to interpretation and how one group sees"must have regard to" is very different to how the powers that be see it"
"It's just a statement with a different name"
"Decision makers and team leaders are still very much processes and pennies before people - they don't always grasp that it's not about offering more or spending more"
"I appear to know more than my child's SENCO," was a comment we received from quite a few of you. Many of the responses questioned whether LAs were aware that they were supposed to be working with families. Many had received a draft EHC Plan without having received any other information and without attending any review meetings. Parents being sent "About Me" page to complete without any explanation of what it was or how it would be used. 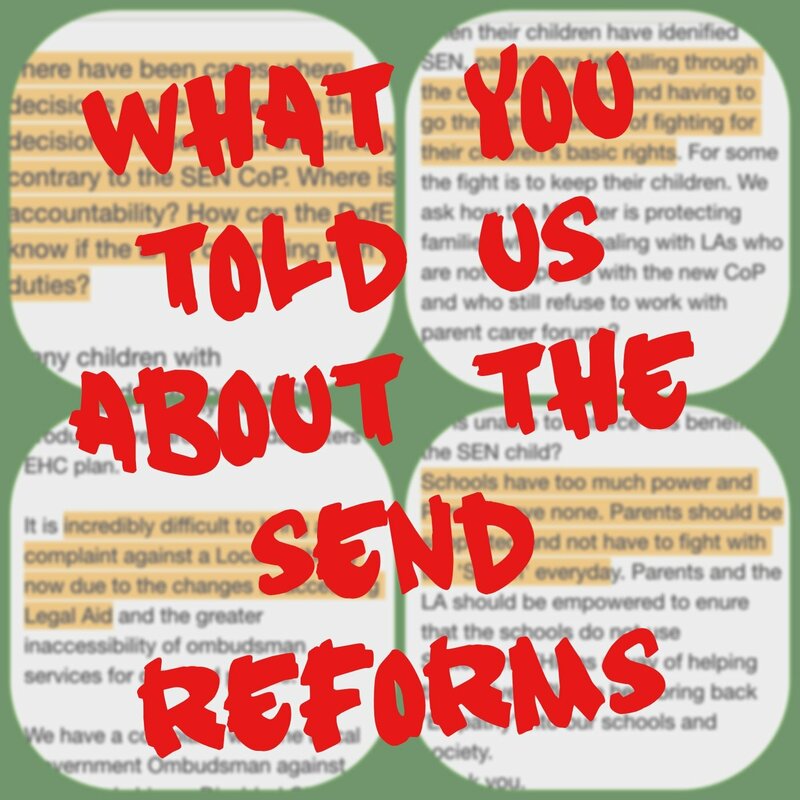 Parents being sent draft EHC plans which appear lengthier than the legislation would advise and without any information about what the different sections actually mean - this was a big concern for those who had previously only had educational input and not health or social care. "The county has substantial difficulty in engaging with parents and young people, very tokenistic and at times quite hostile"
"It appears that our LA are simply there to act as some sort of bureaucratic speed bump or road block designed specifically to slow down and if possible prevent your child/young person getting the help they desperately need"
"Assumptions are made about what our daughter can and can’t do in accessing the process." "The new legislation very clearly states that the young person should be central to the whole process. At no point have my son's views been asked for." Given that many families have had a 'them/us' relationship with their LA or school, to suddenly be asked for information (without an explanation as to how that information will be used or is necessary) is not a great start to a new process. "Why would an LA need to know if the families had a mortgage when assessing social care? or who lives in my home?" It was raised by many that Co-Production had either been "tokenistic" throughout the process or that it had existed during the Pathfinder stage but now disappeared. "Of late co-production ( if it ever really existed as co-production in its truest sense) has tailed off"
"There is a great sense of 'business as usual' and the parent involvement box has been ticked - job done"
This was the biggest issue you told us about. Families not receiving any information, families being given the wrong information, families receiving misleading information and families receiving information in such a jargon filled manner that it made no sense. Families having to continually ask or search for support or advice. "I don't understand what is happening and I am worried that they are going to cut corners and not do things properly. " "No one has explained new system. We went to one meeting, where we were told we had to be more involved in our child's dreams wishes and aspirations"
"I was disappointed to learn that the EHC Plan we drew up as part of the Pilot was in fact non-statutory. I found that out for myself; the LA did not inform me." There were also a few concerns that some LAs were using the confusion around the process to their advantage. "It feels as if our LA have taken the opportunity to make the process more bureaucratic and difficult to access." "We were advised that they can refuse pretty much everything on the grounds that it puts other children/services at detriment, therefore there really is no point in asking for one"
"They said in December that they have until May to make a decision regarding my son's future. Having had a look at their own website, I found out this was misleading. Their own timeline states 14 weeks, as does the Code of Practice." "It's almost as if they're aware of the rules but not really following them and still applying the old rules and hoping that parents don't notice. " There is so much confusion around these. For those families who did understand what it meant, there was still a lack of confidence that they were available. "Getting a personal budget in our area will be like getting your six lotto numbers on a Friday night"
"Denied a personal budget even though we could show that it would save both the local authority and the family money, time and resources." The comments we received around this were all negative. Parents being told "we have no provision so don't bother applying"
Schools only looking at outcomes until the young person leaves the school and not aspirations for beyond that. LA reps insisting on families providing outcomes at meetings but families receiving no information about this beforehand. This was split. About half of those who responded thought the system, eventually, would be better. The other half were not convinced. However, most agreed that the teething problems could be hugely detrimental to those going through the process now. Families are feeling stressed and not supported, practitioners are confused and in some areas very angry at the lack of knowledge or support they have received and the us and them relationship does not appear to be improving, in some cases it appears worse than ever. "I've had years of hell and I cannot keep fighting like this"
"Parents are left falling through the cracks, confused and having to go through the stress of fighting for their children's basic rights"
The plan was poor and would do more harm than help"
"Parents are still having to fight the system everyday"
All of the comments we received (over 30 pages) have been passed to Edward Timpson. He seemed keen to look through them. We look forward to his response once he has had chance to read your comments. Later this week we'll bring you the video interview in digestible bite-sizes. Standby for that - sign up for post alerts so you don't miss out. Should rich Katie Price pay Harvey’s SEN transport bill? It’s totally the wrong debate. This is a great round-up of how it is in reality. Parents are not trying to obstruct; they would like to see this system work because it would mean the right support for their children at the end of the day. However it is definitely not working yet, and no-one, but especially not the DofE, should get complacent about this.